The project, it's nothing big but I just want to write about my simple experiences while gaming. After all, I have a blog that covers nothing but Android, it would be a perfect platform. I'm sure you get my point. So, enough with the chitchat; it's time for real racing. I'm not really an expert gamer. In fact, my 8-year-old son is better than me. So, I would prefer a setup that would be more convenient and the following are settings I think would be best for my skills. Controls - I've chosen Buttons. Steering left and right will be done by tapping the left or right side of the screen and the brakes are engaged when tapping the lower-center portion of the display. Assists - I think I need to have high assists for steering and braking and traction control should be on, too. Camera - while I love the feeling of driving a real race car, I can't control the car well when I'm in a cockpit view. So I've chosen the third-person or helicam view, which reveals the back of the car and provides greater view of the road ahead. With this, it would also be easier to evaluate the angle of the car. There are three races in this stage. All three of them are easier to accomplish and they were intended to attract more gamers even those that are still learning the game. 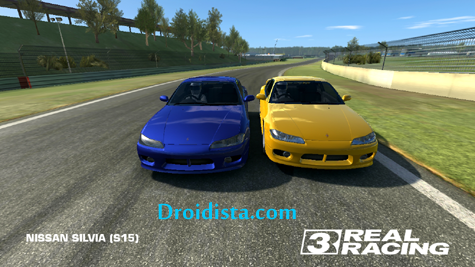 This is my first race driving an all-stock Nissan Silvia S15. Why this car? Well, I didn't really have a choice; it was the only unlocked car and the only one that fits the budget with price RS25,700. The course only has one lap and everyone else was driving stock S15. The race was easy and half-way through, I already overtaken everyone. 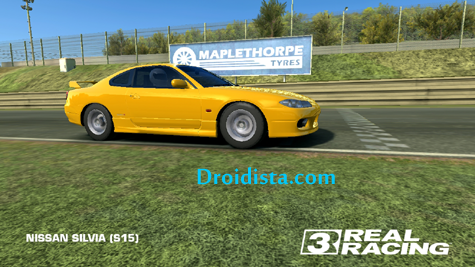 The yellow Nissan Silvia S15, that's mine. 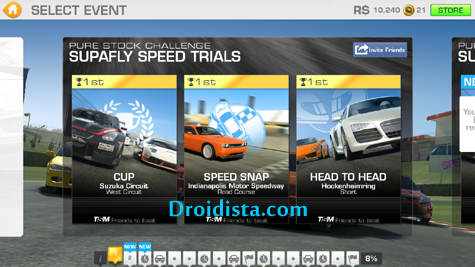 After the race, I earned RS1,850 plus 450 as clean race bonus. With these plus the remaining amount after I bought the car, I was able to buy the first engine upgrade--Basic Engine Tuning--as a preparation for the next race. Engine Upgrade: Mid-spec ECU - it remaps the engine for improved power and efficiency. Drivetrain Upgrade: General Analysis & Overhaul - the process includes diagnostics and adjustments that would allow more power output. With two more new upgrades, which boost my car's PR from 2.4 to 5.1, I finished the stage at 104.64 mph and finally beaten the record set by default. At this point, service isn't required yet. With the same upgrade I added in the second race, my car was still tuned up for yet another race. This time, it's a head-to-head race with a car having almost the same power as mine. So, the race was easy to win and just before we hit half-way, I've already overtaken my opponent. After the race, I've leveled up and ready for a new stage. Still, service isn't required at this point. 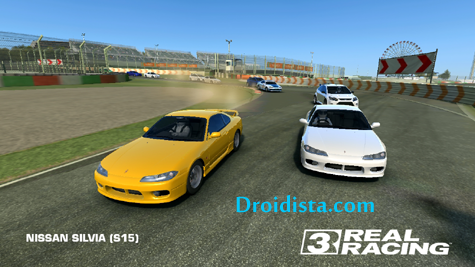 I think I'm gonna love Real Racing 3 and would continue blogging about my races every day until I finished all 1992 races.